I didn't get finished in time for Christmas, but I am making good progress and I am so pleased with the way this HAED Mini is turning out. I just have three partial pages and I will be finished. Happy Stitching everyone!! And a wonderful new year. 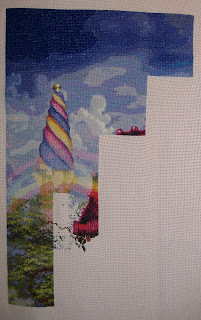 Here is my progress so far on Tuscan Serenade by Dennis Lewan. Its stitched on 32 ct. Ivory Lugana, 2 over 2. I really enjoy discovering the little angels in the pattern. I will try to get Amanda to update on her Pearl Princess by Hannah Disney. Here's my Mini Semiyar update now that I have finished Page 2 and started Page 3. I was worried that the distinct lack of detail in Page 1 would continue throughout as it's been made clear that these Mini charts are the same as the BAP's but with a loss of detail. Saying that Page 2 has made the overall look definitely more detailed and I'm extremely happy with the way that it is turning out. I hope everyone else likes him like I do! This is a time that I rejoice for all I have received, have reverence for those I have lost, and a time to give in the spirit of Christmas. If you find stress in this season, take a moment in silence and listen for the true spirit. Lend yourself to those whom are in need. Then without a doubt, the true spirit and peace of Christmas will fill your heart. Thank you for a wonderful year. May You all have a Merry Christmas and a Happy Healthy New Year. Finally, she's home. The factory, not delivered my first Frame I selected. And I had to pick a new one. This has lasted six weeks. But now she is finally on the wall. Just before Christmas. I am now working with Three Worlds of MC.Escher. Also fun to do. Quite different. And again on 18 ct aida. For the First Rose was very careful not to miss count. The linnnen worked very different. But it was successful. I'm already thinking about goals four next year. last 11 dmc to arrive ready for a new year start. have to wait thank god to pain tablets. Allow me to introduce Faces of Faery 177 by JBG. I started her late October, but then put her away a few weeks for Cirque. The two are now "rotating". She is my first attempt at tenting, and you can see the tension problems, in spite of my effort not to have that happen! Please excuse the Q snaps, it's just too hard for me to get the fabric back on! Happy Holidays everyone and please take some time for yourselves and stitch!! My first post as an official member! I just love looking at everyone's work, and I'm excited to be able to share my own. This is the first HAED I started, back on 27 April 2006. I've taken several breaks from stitching, so I've only put in 56 hours on this. 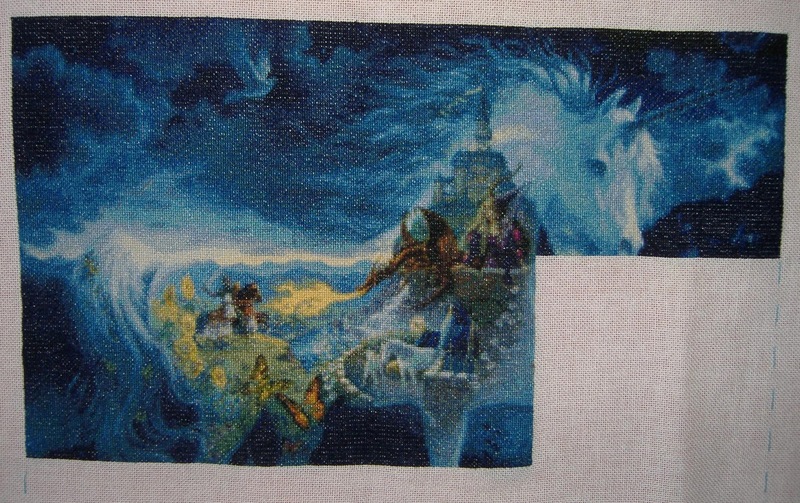 At this point, I've done 6716 stitches, which is 26% done. I worked on this for about 10 hours yesterday and was able to finish up page 9, which is the toe, and completed another 10 rows all the way across, part of which was already done. I'm very pleased with the detail in this!! Finally got an update for you all! I finished page 2 on SK Sunny so I have now finished my goal! Very happy with myself lol. After one week Stitching black and white, I have a page ready. It's something different than all the green. Nice to do. I go one page down. I am curious about the fish. Almost Christmas. Wonderful weekend with family. Here we go..... after a slog well into the early hours of this morning Page One of Mini Semiyar is done! You may think 'Wow that was fast' but keep in mind that I'm working with a Large Format chart here so the pages are significantly smaller than they normally would be. I'm pleased with how it came out but I am hoping that it will look much better as the other pages come along. Hope you guys like what's be done so far and I'll see you all soon! party days and then again for my sons birthday. closer to a page finish. 15 days to finish my goal of 2 pages of faerie melody. Hi everyone! Well I started All Hallows Eve! I am stitching it on 14 count white aida. I am liking this stitch. I didn't realize that it was that big of a pattern, but I like it. My oldest daughter saw this and she really liked it and asked me to stitch it for her. Of course I had to start over on it, because I had the fabric turned the wrong direction. But this is as of tonight. Have a great week! Hi! This is my first post here, but I've been doing Dragon Riders. I'm working on page 7 now, but I have my first row finished already! Well, this is my progress to date. I'm hoping to finish page 1 before the end of the year. You can't see it in the picture, but I added some gold Kreinik Blending Fil. to the DMC 3828 called for in the chart. Just wanted to "dress it up" a little. Happy dance time..... happy dance time!! Yes, you know it! 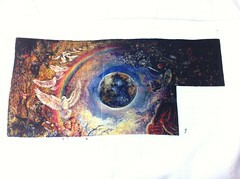 QS Waiting by Ching Chou Kuik is finally FINISHED and she's my 15th Heaven and Earth Designs finish! So....... do you wanna see the finish??? The picture is looking a little washed out as the colours are more vibrant in person. The little cats look so cute and she is looking fabulous. The worry with pink is no longer an issue as it sorted itself out with more time and more detail. I'm so glad that I concentrated on her fully and got her finished so quickly, she was worth every moment and has truly been a complete joy to stitch! Next up is going to be my mystery Mini HAED. I'll be stitching it on 22 count Dove Grey Hardanger, 1 thread over 1 square as usual and using my usual Sulky Metallic machine embroidery thread for the sparklies and I'm starting it tonight. It'll be my sole focus until after Christmas so I'm hoping to get a fair bit done between now and the New Year and I'm well excited! Hope you love Waiting as much as I do and I will see you all very soon. 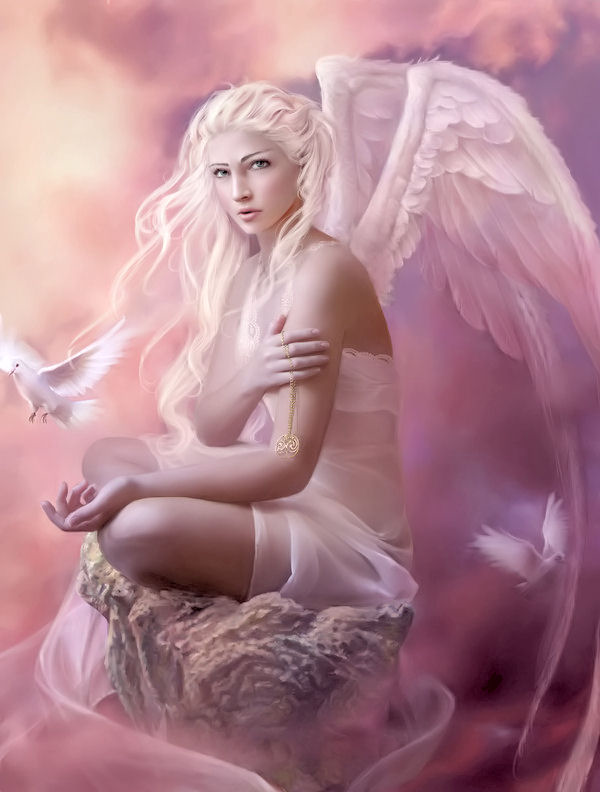 is a drawing of Nene Thomas, ... I love designer, all nice .... its patterns and is called Winter wings .. I'm working on 28 count white cotton fabric with DMC floss wire 1x1 ... there is to lose your eyes, but is being amazing, ... i love it. The new work, Three Worlds of MC. Escher. There is a koi carp down at the work. This is for my son Ivan. I started last weekend. There is much kreinik 032 in. In the lighter part. Nice to see. I collect all the wires, not so long yet. The glass of the First Rose. This is packed. The glass of Escher will not be so colorful. They are only 16 colors. least I had some progress. 22 days to finish my goal of 2 pages of faerie melody. I'm down to about 1/4 a page to reach my goal. leaves & the background stitches up quick. Double success! After a forced week off I've sped up a bit, and managed to finish the actual page of both of my wips! Didn't have much to do on the Unicorn, and this was the last really confetti-heavy page, from now on it's back to the blues :) Only 1 full and 6 partial pages left from the 15! Gaudí didn't go as fast, but still managed to finish it, and on the next page I'm gonna reach the roof again! :) 11 pages finished from the 72. 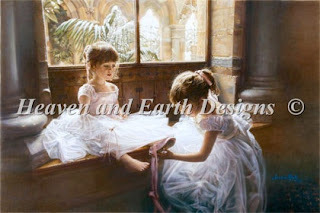 Here is my new WIP "The Ballerina Sisters". 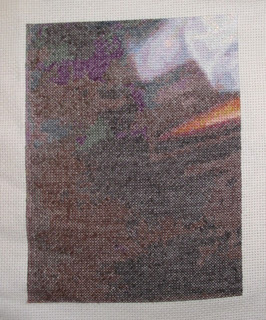 I stitch on 18 ct ecru Aïda. There is 90 colors. It's a 450x300 model. I'm not convinced by this first report. I hope it will get better with the new page. 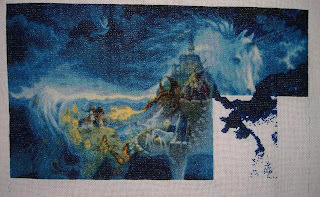 I started at the bottom left, as the Snow Princess, and two pages are already stitched. Cheers and happy holidays to all. I just wanted to share my mini happy dance with you all! I finished page 10 last night on Millennium tree. I still have page 11 (full page) and page 12 (tiny partial page) plus 1 page on blue bird to complete my yearly goals. I am thinking I am not going to make it..... Anyway here he is! I've now completed all my yearly goals. My half-yearly goals look pretty shabby, I'm not even close on those. So here's the goal wrap up so far. Complete one more page (at least) on Goblin Tree, Pages 1 - 12 complete. Completed page 13 & 1/3 of page 14. I am currently working on two new starts, and I wanted to share them with you. Concerning the first one, Mariana, I began to stitch it on the first page, at the left corner. And, for Cecilia, I began to stitch at the top of her head. It's always a joy to be here, and to see everybody's amazing work ! 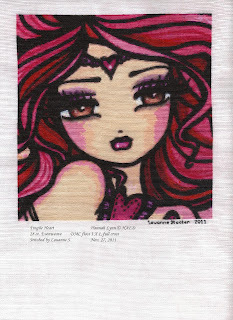 I wish you all great moments of stitching ! First up is the update on Waiting now that Page 6 is finished. The pink worry is now over as it looks so much better now it's clear that it's just shadowing. 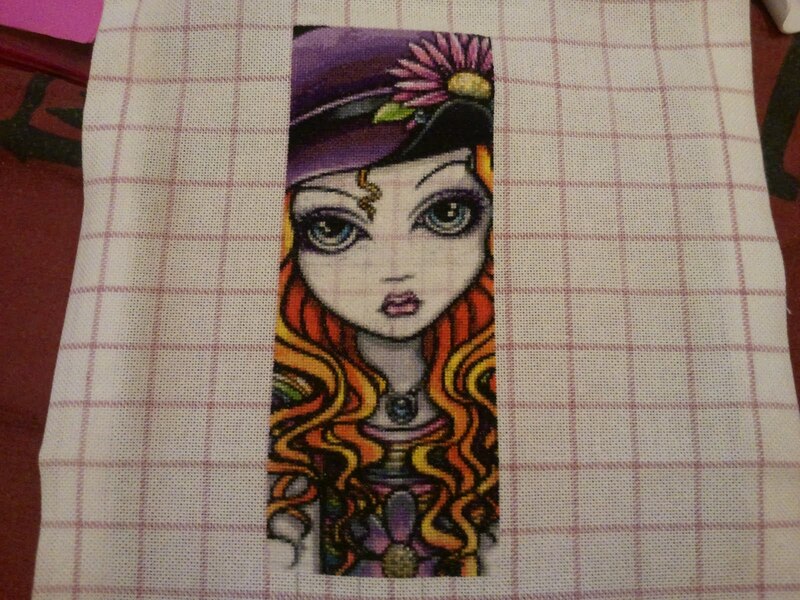 she has her whole pretty face and I got to put a few green stitches in this page which was a bit weird but look fab! Page 6 was the last full page and the bottom row is all partial so they should speed through with any luck and allow me to start my new Mini design (I would have started already but I need the scroll frame that Waiting is on!). I'm still not telling you what it is and will let you all have a guess once it's started! On a more down note I went to see my bowel consultant on Wednesday due to some issues that have occurred. I had hoped that they were due to the operation in May and that they'd settle down with time...... but they haven't and now I have to have a further surgery. Not what I wanted to hear but if this one goes well then I shouldn't need any more. So at some point early in 2012 I will be going off grid for a while to have that done and I am so not looking forward to it but the benefits will outweigh the pain and discomfort as this operation will solve three different issues so it should be worth it in the end. Fingers crossed!! 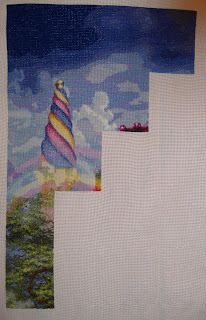 stitch the tree this week I should be close to 1/4 of the page left..
and stitching becomes a lot harder it's a full job just cleaning up after them..
Hi All , Here is Faery Tales with almost one page closer.I'm working this on 18ct aida with 2 threads. And I made a new start on Princess Izzy. 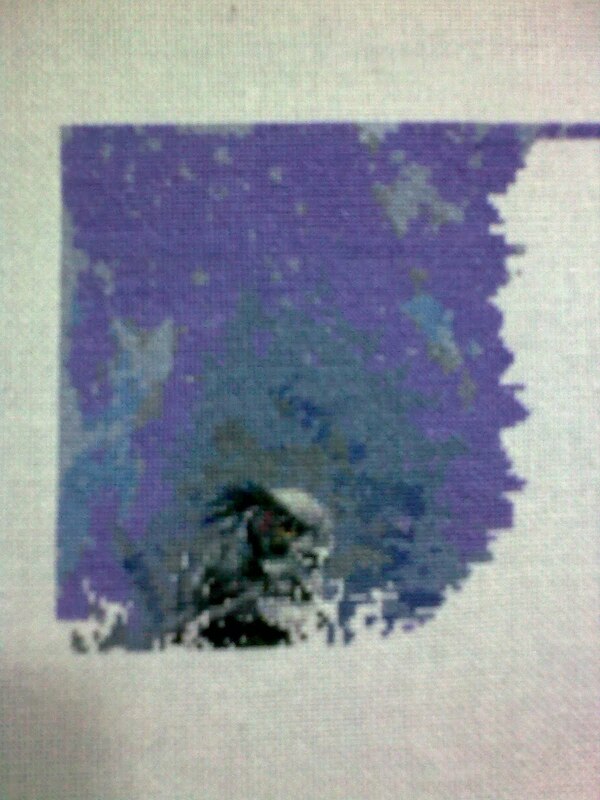 I'm doing this on 20ct aida with 2 threads. 3/6/09 - Many of you have "no reply" on your return email addresses. Some may not realize it. So if we don't reply to your email, just check where you've posted and we'll try to comment back to you there. Please do not ask any copy of the patterns, because we do respect the copyright of the designer. 1. Start with a 10 x 10 grid..
3. Find the same symbol on the 10 x 10 grid below it...take your needle and bring your thread up like you are going to make the first 1/2 of the X ...but don't do it...just unthread your needle and lay the thread down..
Basketweave tent stitch - The basketweave form of tent stitch is worked in diagonal rows up and down the canvas. The yarn on the back of the canvas has a typical basketweave appearance, with alternating horizontal and vertical stitches. Basketweave is the best stitch to use for covering large areas of canvas as it does not distort the canvas as the other two forms of tent stitch do. 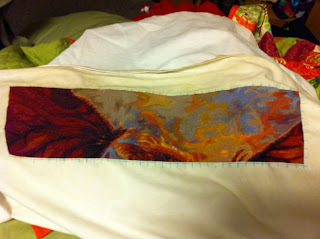 Continental tent stitch - Continental stitch is worked horizontally or vertically across the canvas. On the back of the work, the stitches appear diagonally across two threads. This method uses more yarn than half cross stitch tent stitch but is more hardwearing. 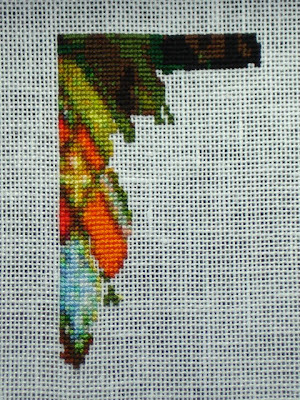 Half cross tent stitch - Half cross stitch is worked horizontally or vertically across the canvas. 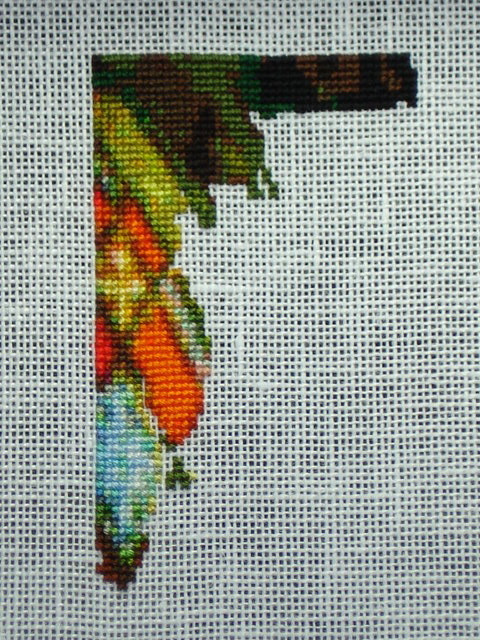 On the back of the work, the stitch appears vertical or horizontal, not diagonal, and crosses only one thread. 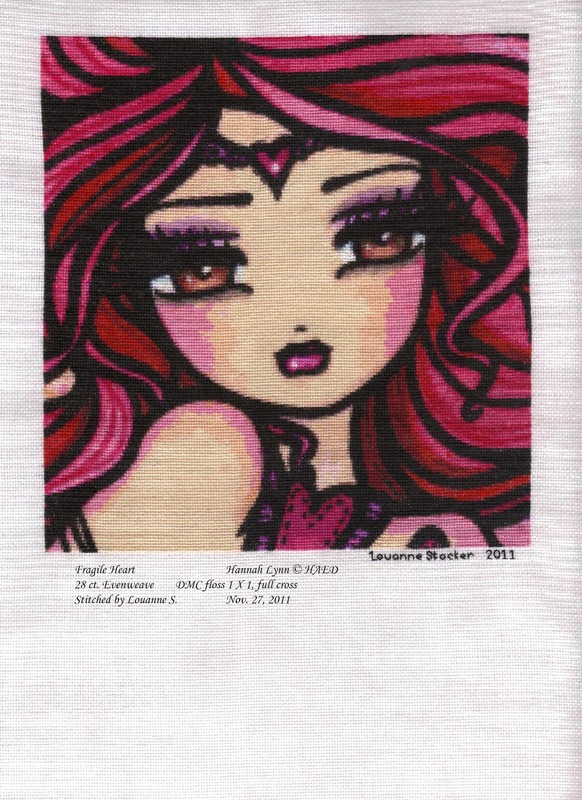 This method uses less yarn than other stitches but is not very durable as coverage on the back of the canvas is a little thin. Membership is full. You may want to become an HAED Buddy. We hope you'll continue to follow our blog and be inspired by our very talented stitching friends! From Kim & Lynn B.